A doctoral student rallies for NTE faculty unionization in 2017. A Tuesday NLRB decision to count contested ballots reversed an earlier vote count that unionized the faculty. The bid to form a non-tenure eligible faculty union failed Tuesday after federal officials granted the University’s request to include 25 contested ballots in the final count. A final tally completed by the National Labor Relations Board showed that of the 25, just two voted in favor of joining the Service Employees International Union, while 23 faculty members voted against. The NLRB recently granted Northwestern’s request that the final tally consider the votes against objections by SEIU. “We appreciate that our faculty participated in the process and acknowledge how close the election was in the end,” he said. The announcement ends a bitter dispute just over a year after NTE faculty filed a complaint with the NLRB accusing the University of unfair labor practices. 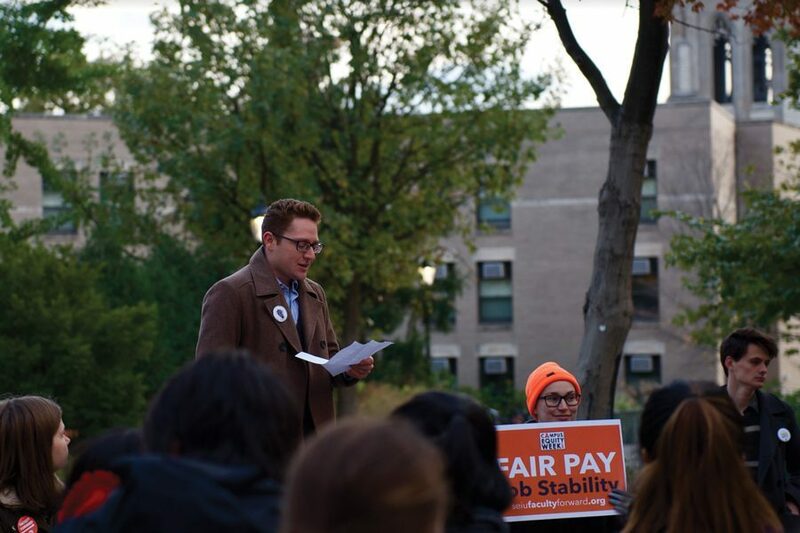 Northwestern administrators had refused to bargain with the SEIU since federal officials certified the labor union as a representative of the non-tenured faculty in May 2017, arguing that the 25 votes were unreasonably excluded. “We are disappointed that Northwestern University administrators chose to hide behind tricky legal tactics and the highly-politicized Trump labor board, rather than work with us to make campus a better place to learn and work,” the group said in a statement distributed by SEIU. Economics Prof. Mark Witte and McCormick senior lecturer Nick Marchuk both believed SEIU’s method of unionization contributed to the final vote against. The labor union, Marchuk said, didn’t involve all non-tenure eligible faculty in discussions, resulting in a complicated voting effort. “In being very secretive, a number of people who didn’t hear from them and didn’t feel like they sat down out with us, made their case and heard our concerns — that got those people against them,” Witte added. As non-tenure eligible faculty from some Northwestern schools — like the Kellogg School of Management — weren’t included in the vote, Witte said a different approach to deciding who to represent could’ve led to a better outcome for SEIU. He added it “would not surprise” him if many non-tenure eligible faculty who didn’t support SEIU still were interested in some form of union representation. Marchuk echoed that sentiment, adding that this experience would be remembered in the future. “We now know the benefits of a union and we’re better prepared to select a union if we try to do it again. I don’t think it would necessarily be the SEIU because we are now aware of other unions that are more faculty and academic-oriented,” Marchuk said.